Every December I set up a nativity village. Today is Santa Lucia Day and Lucia arrived, with her candle wreath. When travelling I always look for small houses and figurines to add to the village, and slowly, slowly it is growing. A new addition this year is a palazzio and a gondola from Venice. I bought it near the Rialto Bridge but was told that it was made somewhere in Africa, of left over materials. Two weeks till Christmas and today we finally found time to put of some outdoor lighting. Advent is a time of busy activities. To make everything okay till Christmas. Is that the way it is supposed to be? Advent is a walk towards Christmas. The celebration of the birth of Jesus. December used to be a month when I waited for the postman with anticipations. How many Christmas lettes would arrive in my mailbox today? In the golden days I could get 10-20 every day during advent. Over the years this has changed. Now there are hardly any left. At least in the mailbox. Now they come to the inbox on my computer. If they come at all that is. I used to fight for the art of snail mails. But still I write fewer and fewer every year. Christmas letters and cards is something I still try to do though, even today when my mailbox is empty most days. Today I made myself a pot of hot chocolate with chili. And sat down to write. Do you still handwrite your Christmas letters, and send them by snail mail? Somebody are making preparations for the music on the field of Bethlehem. It is lillejulaften, little Christmas Eve, the day before the festive season stasrt. Here in Norway it is the night for seting up the Chrostmas tree, here in the House in the Woods it is also the night of thje traditional lutefisk party. For many, many years now, we have filled the big diningroom table with guests, serving the traditional lutefisk dinner. Today was supposed to be a bit different though, and it turned out it was, though in another way than planned. It started with a phone from our daughter Ingrid some time ago. "Will you have your lutefisk party this year". "Well", I replied, "we are not quite sure, I guess so but no plans have been made yet." Then another phone from Ingrid a few days later. "My mother in law is coming down from Lofoten for Christmas. She will come with her car filled with fish from Lofoten, and she wants to invite you to lutefisk in our home on lillejulaften." I smiled for a long time then. Yes, to be invited to a lutefisk party! Both Terje and I simply love lutefisk. As you already know, last weekend we all got a stomach bug. We are fine again now, but as soon as Ingrid´s mother in law came, she got it too. This resulted in another phone call from Ingrid. "Sorry, my mil is sick and we have no idea how to prepare lutefisk. There will be no party on lillejulaften. So in the end Terje and I had our own lutefisk dinner for two. Now we are ready for Christmas. Starting with a family reice porridge lunch tomorrow. From old times the 4th Sunday of November is called Dirty Sunday here in Norway. The name tells that on this Sunday you were allowed to do housework in spite of the day being a Sunday, to manage everything in time for Christmas. And my house is a dirty house today, or a charming chaos as I prefere to call it. I have made (scrapbook style) and written all the last Christmas cards, and I have baked, baked, baked, baked - yes, four different types of cakes. With the three we have from before, our Christmas tins now hold 7 different types of cookies, which was the number a housewife had to have in earlier days. 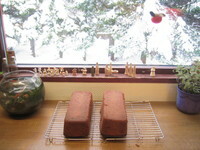 The first kitchen photo shows the chocolate sweets I made, the second my two first fruit cakes of the year. I usually bake several of them and give away as Christmas presents to friends and family, but this year I am afraid there will not be that many. 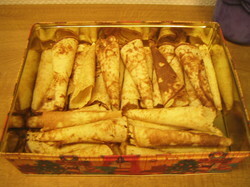 I tried a new "krumkake" recipe this year. Had some start problems, the first ones got a little misshaped - perfect for "before Christmas eating" :-) And then the last cookies I baked were also new to me. We call them "coke cakes" - because the taste is a little bit like the taste of coke I think. They are Marta's favorites , and turned out to be quite easy to make. Well, I am pretty satisfied with myself. 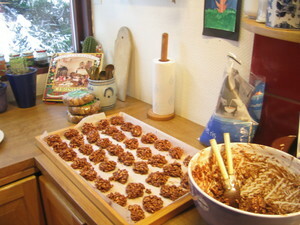 The only thing I missed during the day was cross country skiing with Terje and Marta, but sometimes you have to make a choice, and today baking was more important. I still have a few extra Christmas cards to write - people I've met during my many travels this year, and whom I want to send a few photos or just say thanks for the meeting :-) Writing these cards will be a perfect way to spend the evening. Lucky me. On my way from the office to the bus I walk through the Christmas market. Every day :-) And every day I see something new, though I seldom buy anything. Today I walked through the Christmas trees section. Spruce and pine in all sizes for sale. People have start buying their Christmas trees now, though it is still a week till we set them up indoors and decorate them. Christmas is still a week away. This is advent. I loved the smell of real trees as I walked around. Due to my sinus problems we bought an artificial tree a few years ago. I cried when we sat it up the first time, but it turned out to be a beautiful tree, and now we don´t need to throw the tree out after just a couple of days. But.......real or artifical, putting up the tree is still one week away. Time for rømmegrøt and a family tale of the wrong grandma? I grew up with Saturdays as porridge for lunch days. Mostly rice porridge, but from time to time, especially if the day was a special day, we had rømmegrøt, or sour cream porridge. Grandma Olga was the queen of rømmegrøt, and we kids loved it. I remember once, my parents were away and we three oldest kids took care of our little brother Torodd for a few days. While we were at school, a neighbour looked after Torodd, and one day, when my brother Frode came to pick Torodd up, the neighbour said: "Your grandma called, she has made rømmegrøt, and you are welcome over to eat with her." Both boys smiled, "Yes, rømmegrøt!" and took the bus to grandma Ragna Josefine, not knowing that both them and the neighbour mixed it all up. It was not grandma Ragna Josefine who had made the rømmegrøt, but grandma Olga. Grandma Ragna Josefine was a little surprised when the boys came, it was a long bus ride from our house to hers, but she was happy to have them over, she imagined they must be hungry and put out some bread, jam and cheese for them. The boys didn´t quite know what to think, but ate the bread, had a nice time with grandma Ragna Josefine and grandpa Johannes, and took the long ride back home again. Grandma Olga had big pot of left overs that night. Terje and I had planned to have just plain bread and jam and cheese for lunch today. Before the meal Terje went over to the grocery store to do some weekend shopping, and suddenly I felt an immense craving for rømmegrøt. I phoned Terje, "Are you still in the store?" "Yes" he answered. "Oh, please, will you buy some sour cream and an extra bottle of milk. I want to make rømmegrøt for lunch" I almost cried into the cell phone. I could hear Terje smiling. He loves, simply loves rømmegrøt (as he loves all what I serve him, but that´s another tale). By the way, I often hear Americans serving what they call rømmegrøt, but believe mw, if it is not made out of rich sour cream it is not the real thing. Then it is what we in Norway call fløyelsgrøt, velvet porridge, or smørgrøt, butter porridge. Since I started the new blog "Walking Through the Year", I am trying to following each and every day as they unfold. I have several books on the theme, and on December 7th I read about St. Ambrosius, a bishop in Myra around 300 years after Christ was born. I did not blog about Ambrosius on that day, but he stayed in my mind for the rest of that day, and again the next. His name was familiar to me somehow, but why? Then, suddenly, I knew. My father in law used to bake some special breads for Christmas which he called Ambrosius Breads. Father in law had an old cookbook which all of us wanted after his death. The lucky one to get it was my niece Tone. A perfect choice, since she is a born baker :-) Terje and I did get another of his "kitchen books" though, a tiny little orange notebook, filled with recipes. Many cut and glued from magazines, but also quite a few handwritten ones. I was sure the Ambrosius Bread recipe was in the books Tone got, but decied to flip through the orange one anyway. And guess what I found there :-) Yes! The recipe. I was so happy, I almost ran to the grocery store to get what I lacked, and last night I was fianlly able to bake the Ambrosius breads. Just as we went to bed, 4 huge bread were finished. And today I woke up to the most christmassy fragrance in the whole house. Especially perfect since a good friend came over for lunch.